In his book, I will teach you to be rich, Ramit Sethi strongly advocates reducing your monthly outgoings as the first step towards financial freedom. The second step however, is a little more complicated. When you switch your phone network to one with cheaper call rates and you realise that you have saved an extra N1200 each month – what do you do with the money? Do you “treat” yourself to a takeaway (hereby spending over N1200) or do you have the discipline to put your instant savings into an account where you can see it? The argument is that failing at this final stage will take you back to Step 1. If you want to grow rich slowly, over time, you need to overcome this failure and create a system where you can save your savings before they turn into temptations. If you can save that extra N1200 each month for a year, that’s an extra N14,400 bonus for you at the end of the year – which you can transfer towards one of your goals. The question is can you find the discipline to do it? With increasing needs/wants, you have to be very brave to stash money away when Black Friday is now a one-month-long shopping season. The current research basically suggests that willpower doesn’t work (that’s why we keep failing) and that to achieve great results, we have to change our habits by changing our environment. In this case, if you want to save money, set up a standing order to deduct it from your account – like tax at the source, so that you don’t even see it to spend. If you want to dig deeper into this psychology, the book is called Why Willpower doesn’t work by Benjamin Hardy. It is a hot new release (released on March 6th), 2018 so I think it is only available on Amazon for now. That’s where Piggybank steps in. But have no fear, Piggybank.ng may just have the perfect solution for you. Piggybank.ng is a Lagos-based startup aimed at helping Nigerians save money. I’d imagine the idea was inspired by the square wooden piggybanks some of us may be familiar with growing up. In this case, you don’t need to shatter any box to withdraw your money. Everything is handled electronically. 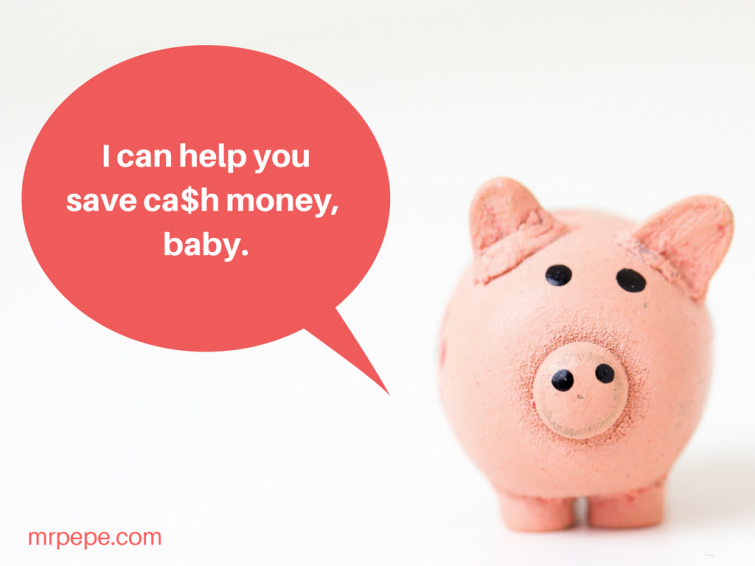 Piggybank helps you save by debiting money from your bank accounts. On signing up, you are first asked to save N100. This, I feel, is you to test the system to see how it works. The second step is entering the bank details of the account to withdraw to. Lastly, you then choose how you want to be saving. You can also set when you want to withdraw. Any withdrawal before the set date comes with a 5% commission on the amount withdrawn. So, if for example, you’ve deposited N100, 000 and want to withdraw before the withdrawal date, you lose N5, 000. Withdrawals on pre-selected withdrawal dates are free of charge. By default, Piggybank allows you four free withdrawal times a year (one every quarter). These are 31st March, 30th June, 30th September and 31st December. One fear that came to mind when I heard of Piggybank is if it’s safe. With the way MMM toyed with people’s destinies, you’ll understand my initial skepticism. Piggybank assures her users of the security of their funds. The startup has partnered with UBA which holds users’ savings. UBA is duly duly insured by the Nigeria Deposit Insurance Corporation (NDIC). On debit cards, Piggybank has partnered with Paystack to manage all card payments. (In case you missed it, Paystack is a Nigerian fintech startup that has secured over a million dollars in funding). So, fret not, your funds are in good hands. Just like conventional banks, Piggybank offers interests on savings. a 1.5% interest is added at the end of every quarter provided you have the ‘Autosave’ feature on. The SafeLock feature (similar to fixed deposits) lets you lock your money for a fixed tenor with interest. Longer tenors come with higher interest. You can lock your funds for up to 1,000 days to get 30% interest. Any amount locked for 10 days yields a 0.3% interest. 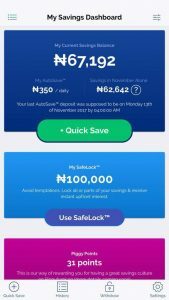 At the end of the SafeLock period, your money is automatically returned to your Piggybank account. I’ll be honest, there are others ways I know people use to force a saving culture. One of them is opening a bank account without taking a debit card. Or you could go the old school way with ‘akawo‘ if you still have them around. I like Piggybank because of the ease of use. You can save anywhere, anytime. All you need is an internet-enabled device and your debit card. A killer addition will be the option to save to one’s Piggybank using USSD. I probably should be paid for this suggestion. 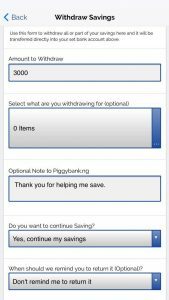 In conclusion, I’d say Piggybank.ng aptly tackles a saving problem many people face. I can easily visualize its use in paying house rent, school fees or saving for that holiday trip. If you care about your personal finance, it’s a nice tool to have in your arsenal. You can check out Piggybank.ng by visiting their website. Thank you for your entire work on this blog. Ellie really loves participating in investigations and it’s really simple to grasp why. We learn all of the compelling form you render informative suggestions on the website and as well invigorate contribution from other people on this point plus my princess is actually learning a lot of things. Take advantage of the remaining portion of the new year. You are doing a great job.